The United States Department of Agriculture plans to announce Monday that it will spend $52 million to support local and regional food systems like farmers’ markets and food hubs and to spur research on organic farming. The local food movement has been one of the fastest growing segments of the business, as consumers seek to know more about where, how and by whom their food is grown. But local farmers still struggle to market their food. Distribution systems are intended to accommodate the needs of large-scale commercial farms and growers. Grocery stores and restaurants largely rely on big distribution centers and are only beginning to figure out how to incorporate small batches of produce into their overall merchandise mixes. Farmers’ markets are proliferating around the country, increasing 76 percent to 8,268 since 2008, according to the Agriculture Department, but they have trouble marketing themselves. And few consumers are aware of a website the department created to help them find a farmers market in their area. “These types of local food systems are the cornerstones of our plans to revitalize the rural economy,” Tom Vilsack, the agriculture secretary, said in a telephone interview. “If you can connect local produce with markets that are local, money gets rolled around in the local community more directly compared to commercial agriculture where products get shipped in large quantities somewhere else, helping the economy there. ”The $52 million will be the first outlay to local and organic enterprises of the farm bill signed into law by President Obama in February, which tripled the amount of money aimed at that sector to $291 million. The organic business, which has long complained that the Agriculture Department does not support it financially, will get $125 million over the next five years for research and $50 million for conservation programs. Read the full story via U.S.D.A. 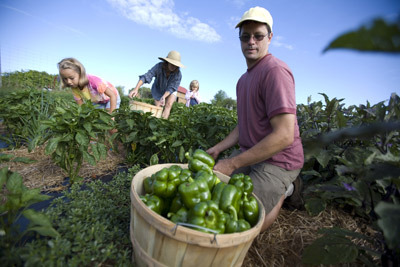 to Start Program to Support Local and Organic Farming – NYTimes.com.